I have told the stories of many heroes of the anti-Nazi resistance in these essays. I've tried not to overemphasize them–I've deliberately left their numbers to be about half of those stories told here--but the war years of 1939-1945 being, what they were, the crossroads of the Western World's being, it produced many individuals whose silent bravery in the face of evil still stands out almost a century later. This is one last story I want to tell of these brave people, and it is, perhaps, the most remarkable of them all. Working in this organization as an apprentice–he was after all not quite old enough to serve in the military–he came across other young men with a tendency toward social liberalism and toward doubt of the established authority. Through his friendship with three of them – their names, let it be remembered, were: Karl-Heinz Schnibbe, Ruddi Wobbe, who were fellow Latter-day Saints, and one Gerhard Duwer – he began to doubt what he was being told in the news media and the state-controlled cinema. He started to listen to the BBC over a short wave radio that had belonged to his brother. 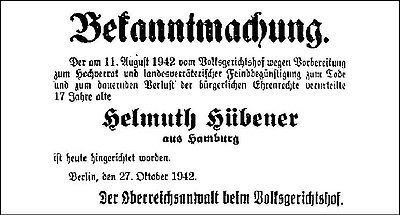 Over the course of several weeks in 1941 and 1942, young Mr. Hűbner began to write anti-Nazi leaflets, to copy them, and to distribute them in public, by posting them on bulletin boards, placing them serruptitiously in coats and clothes, and scattering them in public places. He wrote sixty leaflets that denounced the war and one that openly predicted Germany's and Hitler's defeat. He was arrested after one of fellow apprentices turned him in to the authorities. In August 1942, he was tried, at the age of seventeen, by the Volksgerichtshof: the German People's Court, eventually headed by the despicable Roland Friesler, described in earlier essays as the executioners of the White Rose group and of the July 20 coup leaders. After hearing Mr. Hűbner defend himself, the judge used the youth's sincerity and clarity of thought as evidence that he was, in fact, a knowledgeable young adult, beyond the average level of maturity and knowledge of his age group: and as such, that he deserved the death penalty. Helmuth Hűbner was executed on October 27, 1942, in Berlin's Plotzensee Prison, by guillotine. He was not yet eighteen. His friends survived and eventually moved to Utah; as of 2010, Karl-Heinz Schnibbe lives today, at the age of 84, one of the last witnesses and survivors of the world's most evil court.